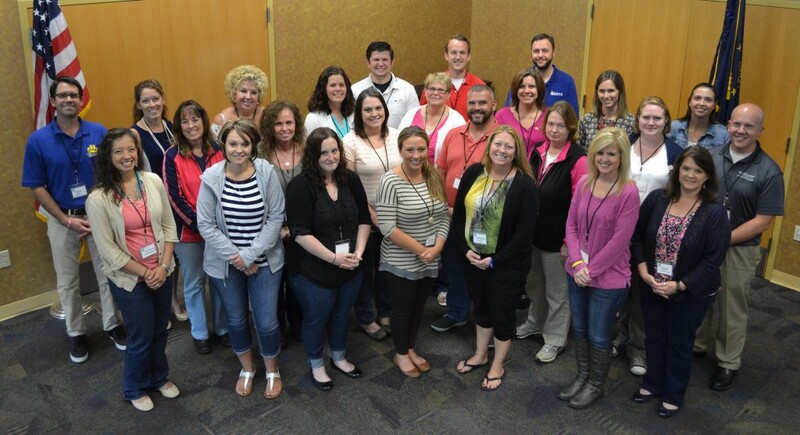 Members of the 2016-17 class of Leadership Hancock County completed their two-day retreat on Friday, Sept. 16, picking up valuable insights about team-building, consensus-building and problem-solving from a series of speakers. The class, consisting of 25 emerging leaders from a wide variety of entities in the county, will next meet on Oct. 5 for History Day. 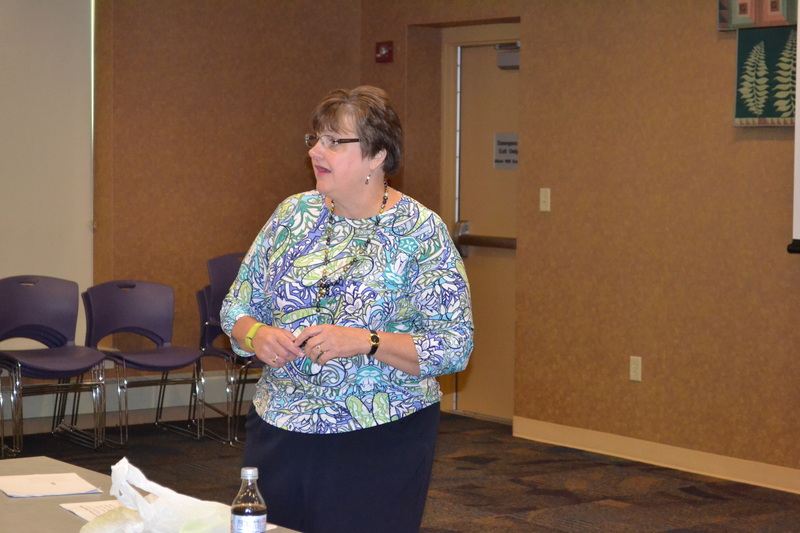 Scroll down to see more photos from the retreat, which was held at the Hancock County Public Library. 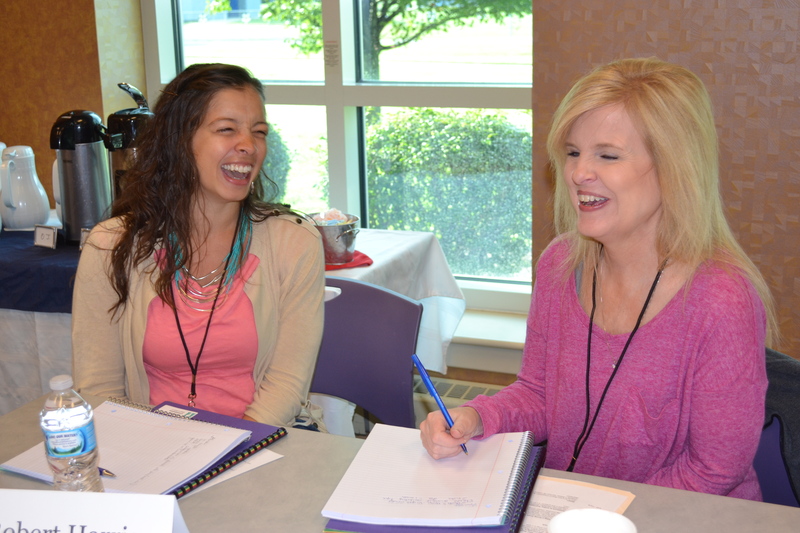 Laurene Lonnemann, a marketing professional at Elanco Animal Health (left); and Gina Jackson, a health information systems supervisor at Hancock Regional Hospital, share a light moment during the opening exercise of their retreat on Thursday, Sept. 15. The two took turns interviewing the other before introducing their classmate to the rest of the group. 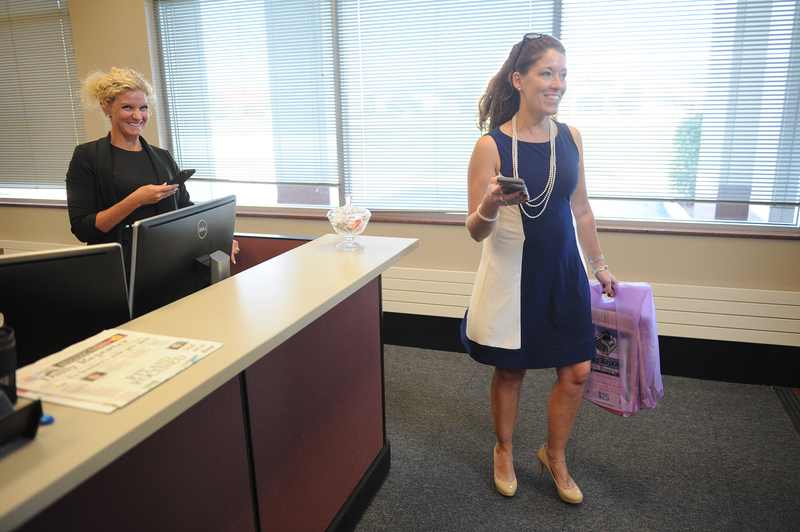 Lisa Thompson, operating room coordinator at Hancock Regional Hospital, turns on her heel to hit the road after making a stop at the Daily Reporter on the Leadership Hancock County Scavenger Hunt on Thursday afternoon, Sept. 15. Greeting Lisa (and members of five other teams who were making the rounds on Thursday) was Andrea Mallory of the Daily Reporter, who pointed the visitors toward materials the class members were charged with picking up during their quests. In this case, it was a replica of the front page of one of the first editions of the Daily Reporter from 1908. Andrea also is secretary of the board of directors of Leadership Hancock County. Lisa and her team won the Scavenger Hunt with a score of 188 points out of a possible 200. Lisa was the team’s driver. Tom Seng, one of the founders of Leadership Hancock County in 1995-96, introduced the class to the history of the organization on Day 1 of the retreat. Many members of LHC’s first class, he told the group, went on to occupy important positions in their communities. 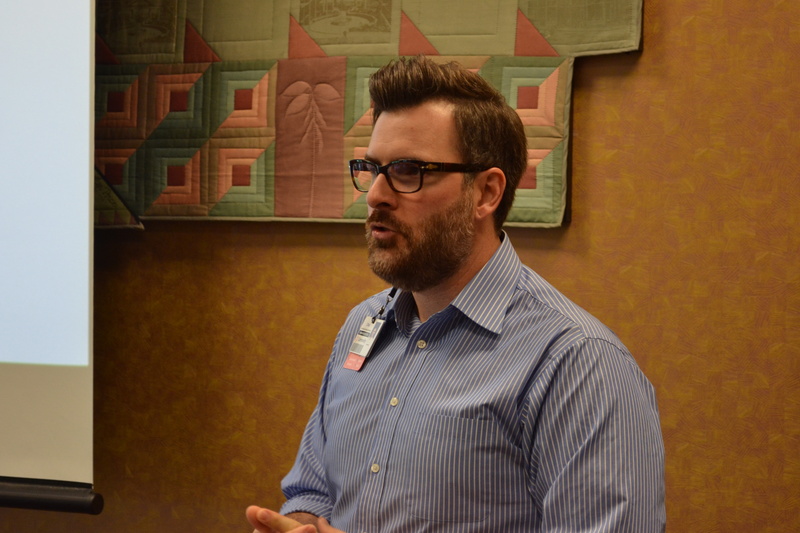 Chad Chalos, an instructional designer and educator with Community Health Network, reveals the 2016-17 LHC class’s DiSC profile assessment. The DiSC scores, which explain an individual’s personality style and leadership traits, are a key part of the LHC experience. Community Health Network’s team processed the assessments this year for LHC. 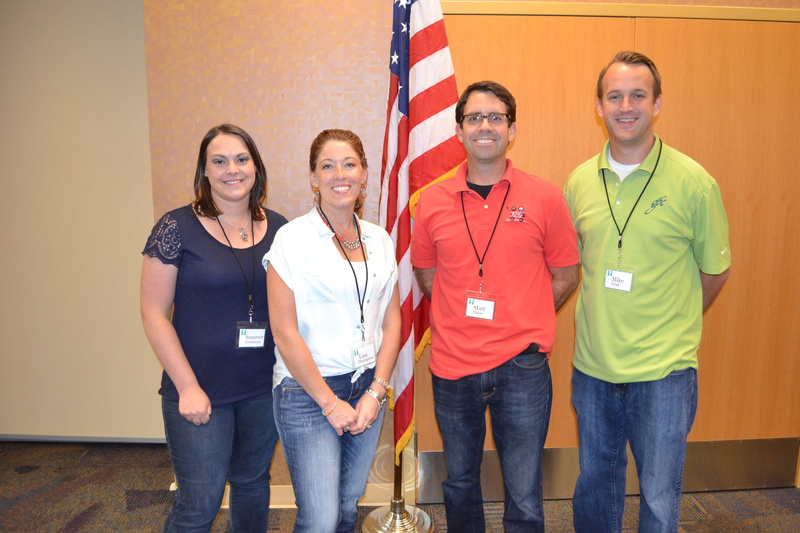 Winners of the 2016 LHC Scavenger Hunt: Summer Grinstead, an administrative assistant for the city of Greenfield; Lisa Thompson, OR coordinator at Hancock Regional Hospital; Matt Davis, Principal at J.B. Stephens Elementary School in Greenfield; and Mike Graf, a vice president at Greenfield Banking Co.
Members of the Class of 2016-17 enjoy a cold one before their Day 1 dinner at Griggsby’s Station in downtown Greenfield. 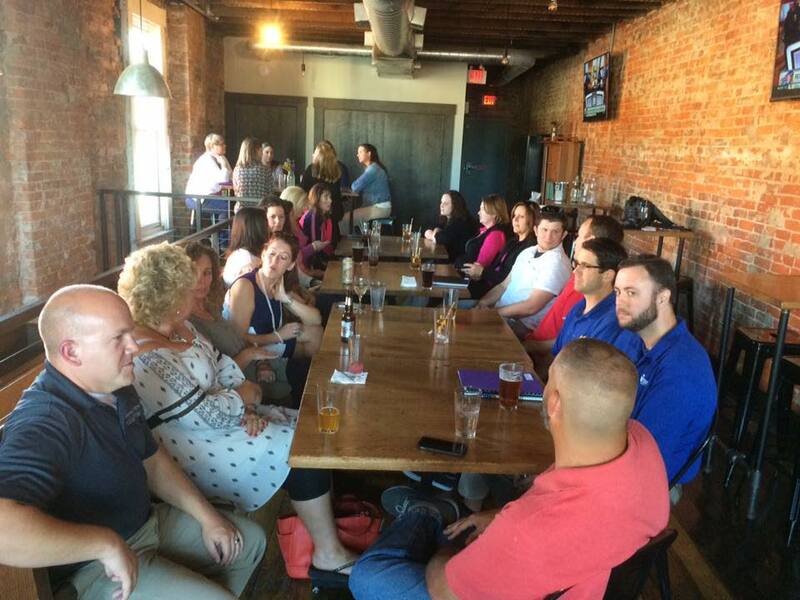 The restaurant sponsored the LHC Scavenger Hunt earlier Thursday. 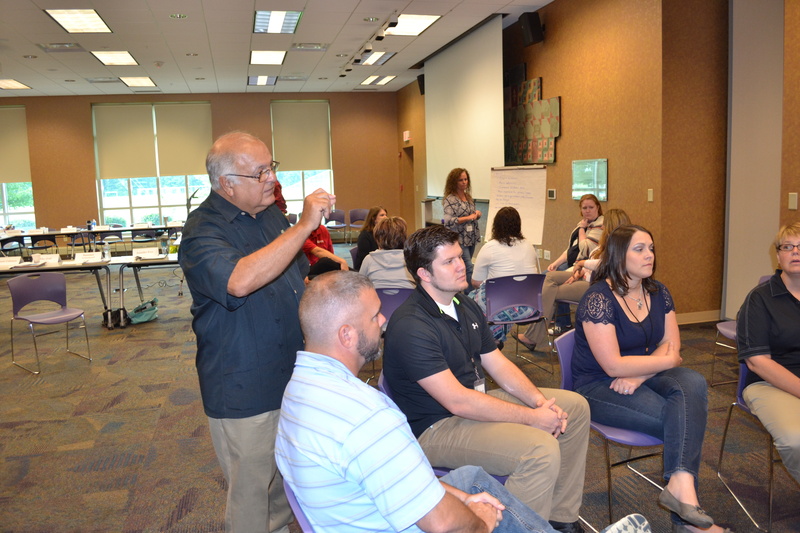 Ed Freije, a retired school administrator who was principal at New Palestine High School for 25 years, coaches class members (including Aaron O’Connor, foreground, Rob Caird, Summer Grinstead and Susie Coleman, far right) on the fine art of consensus building. Tackle the “worst” first, Ed counseled the class, suggesting the best way to find consensus is to meet contentious issues head-on. 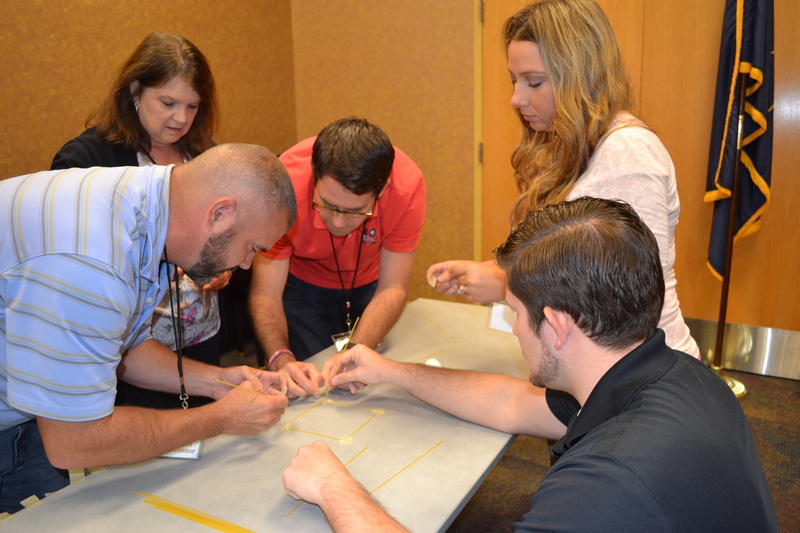 Aaron O’Connor (left), Cindi Holloway, Matt Davis, Rachel Cremeans and Rob Caird (right) engineer a tower made of spaghetti in a team-building exercise on Day 2 of the Leadership Hancock Retreat on Friday. 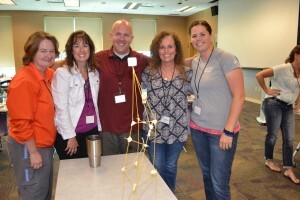 The group’s task: Using a set list of materials, they were to erect a tower capable of standing on its own with a marshmallow on top. The group’s creation didn’t quite pass the test. Lisa Thompson (left), Nicole Mann, Kate Brown and Rachel Dennis test their structural integrity of their spaghetti tower during a team-building exercise Friday afternoon. The exercise was designed in part to show team members the importance of overcoming fear of failure. It was an easy lesson on Day 2 of the retreat! Facilitator Jesse Keljo puts a tape measure to a spaghetti tower. 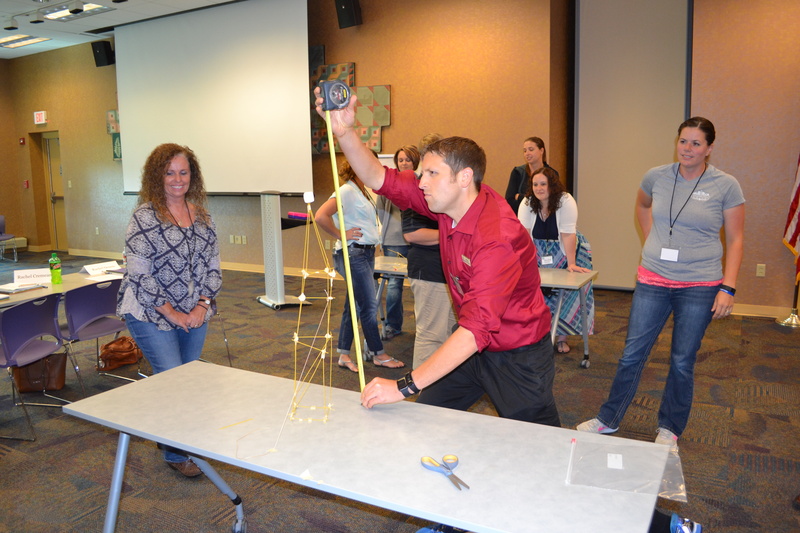 It topped out at 28 inches without toppling, making it the winner of the exercise. Their spaghetti tower won’t win any architecture awards, but it was a good lesson in team-building for the winners of Friday’s exercise: Teresa Smith (left), Dede Allender, Robert Harris, Debbie Grass and Jennifer Frye. 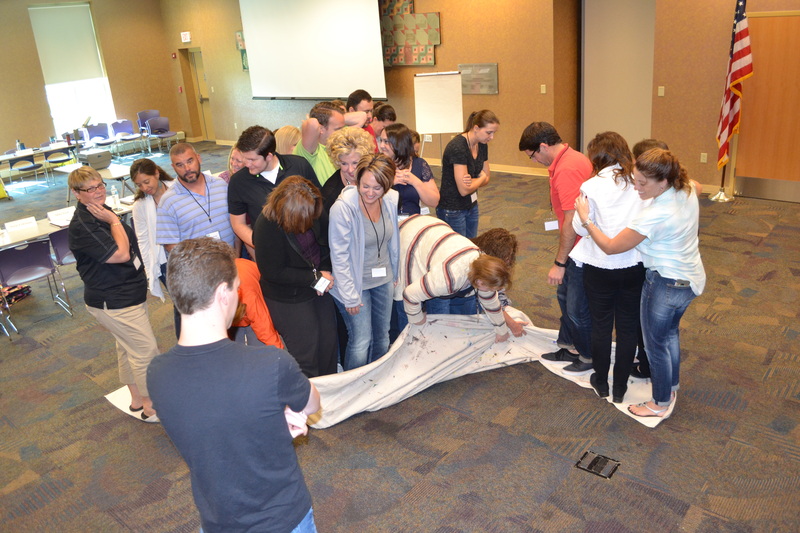 Facilitator Cody Flood (foreground, with back to camera) plays referee for a group exercise called “Blanket Flip” on Day 2 of the Leadership Hancock County Retreat on Friday. The blanket, on which all 25 class members were standing, had to be flipped to its reverse side without anyone stepping off. Handicapping the effort was the fact that half the group wasn’t allowed to talk and the other half wasn’t allowed to use its hands. The class successfully completed the flip on the second try, which Cody said was impressive. 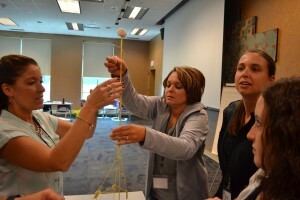 After two days of team-building, some class members said this wouldn’t have been possible had the exercise been attempted on the first day of the retreat. As Rachel Dennis and Debbie Grass begin their studies in Leadership Hancock County this fall, they enjoy a distinction none of their classmates can claim: They are winners of the Nancy King Scholarship, which pays most of their tuition to attend the class. Dennis is the new victim’s advocate in Hancock County for Alternatives Inc., which provides services for victims of domestic violence. Grass is a teacher at Eastern Hancock High School, where she helps oversee the Royal Leadership Academy for students. 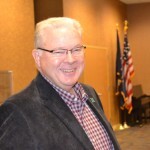 The scholarship is in honor of one of the founding members of Leadership Hancock County. King, who died in 2010, helped establish the scholarship to help deserving applicants enroll in the eight-month leadership academy. 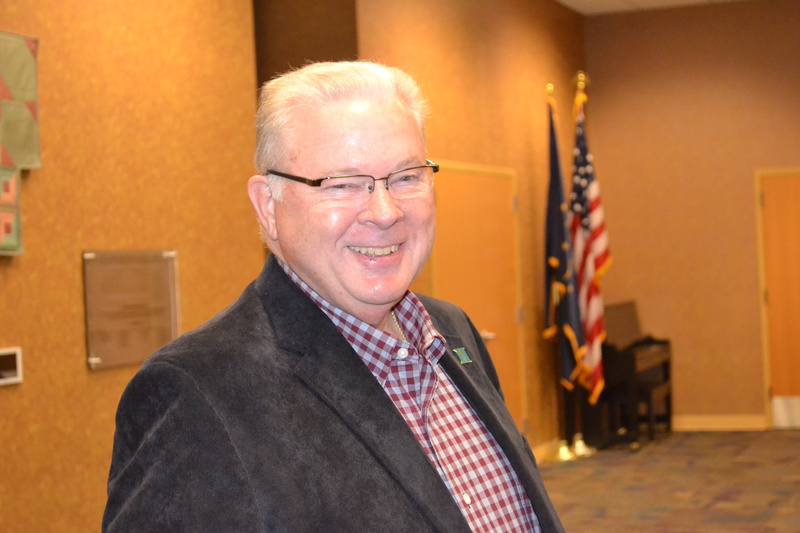 King was a longtime extension educator who was active in many community organizations. She is credited with helping establish Leadership Hancock County in 1996. Dennis and Grass, in essays that accompanied their applications for the 2016-17 class, said they are eager to hone their leadership abilities. Both already occupy leadership positions, and they said it was important to expand their knowledge of leadership qualities. 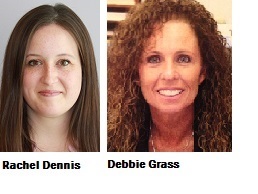 Grass and Dennis are among 25 emerging leaders who are beginning their studies this fall. They will attend day-long leadership seminars one full day a month for the next seven months and participate in a community project. Organizers have finalized the agenda for the two-day retreat to kick off the 2016-17 class of Leadership Hancock County. 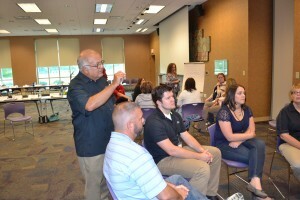 The 25 class members will gather at the Hancock County Public Library for a series of exercises, presentations and conversations as they begin their studies for the leadership academy. Among the exercises will be the popular Scavenger Hunt, in which the class members break up into teams and travel throughout the county in a series of quests. The Scavenger Hunt is being sponsored by Griggsby’s Station restaurant in downtown Greenfield. The group will gather for dinner at the restaurant at the conclusion of the Scavenger Hunt. The winning team will receive gift cards from Griggsby’s Station and LHC. 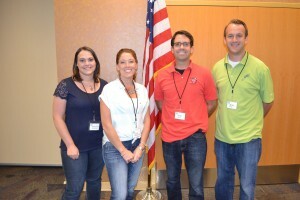 The retreat was organized by a volunteer committee of day chairs. They are: Kara Harrison, Hancock County Community Foundation; Donnie Munden, Hancock County Sheriff’s Department; Jesse Keljo, Hancock County Public Library; and Cody Flood, also a member of the library’s staff. You can look over the schedule by clicking on the link below.